This is the 9th square of the 2018 Knitterati Gradient Lapghan. Local handknit, crochet, or sew blankets. The blankets are collected and donated to local hospitals and shelters for use by children. Making the blankets enriches the lives of the volunteers who craft them, by offering a rewarding and fun service opportunity. To date, Project Linus has donated nearly 6,350,000 blankets to children in the United States. Donations to Project Linus are tax deductible as it is a 501c3 organization. For additional information, please visit www.projectlinus.org. 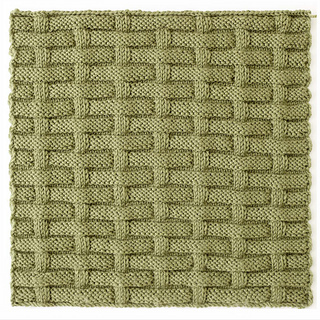 22 sts x 45 rows = 4” (10 cm) over Pillowtop Basketweave pattern stitch using US 6 (4.0 mm) knitting needles, unblocked.